Keep your employees and loved ones safe with bloodborne pathogen protection. Bloodborne pathogens are pathogenic microorganisms found in human blood or bodily fluids that can cause disease including (HBV) Hepatitis B Virus, (HCV) Hepatitis C Virus and (HIV) Human Immunodeficiency Virus – the virus that causes AIDS. It is important that you protect everyone from potentially infective materials when an accident occurs. 1staidsupplies.com specializes in first aid supplies to help aid in protecting with a full line of bloodborne pathogen protection products. Below you will find many products to prepare you in case of an emergency where blood is present. For hand protection, we offer many types of gloves including latex, nitrile, and vinyl medical exam gloves to aid in keeping your hands free of bloodborne pathogens. Biohazard marked containers and sacks are available for disposal of objects and cleaning products when blood is present in an area. A very popular product we carry is our bloodborne pathogen kit that contains personal protective equipment mandated by OSHA to protect from occupational exposure to infectious bodily fluids. There are also singular products that include sanizide cleaner and disposable germicidal wipes. You can order your bloodborne pathogen protection products online or give us a call today for more information. 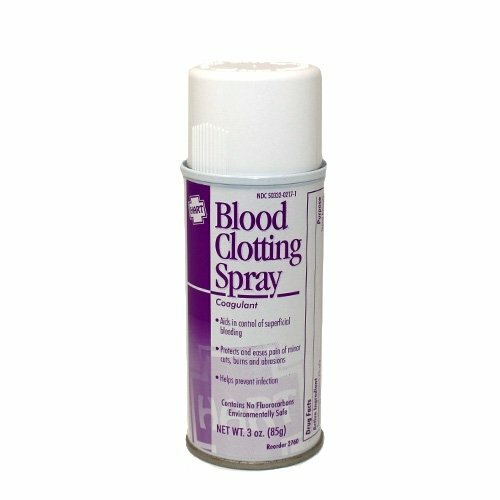 Stop bleeding FAST with our medicated spray - a must for any first aid kit. Controls superficial bleeding; contains no fluorocarbon. Product #064033. Personal protection and cleanup items mandated by OSHA and the CDC to aid in the cleanup and disposal of up to one full liter of infectious bodily fluid. Provides easy, universal dispensing of various disposable latex, vinyl, and nitrile gloves. Conveniently wall mountable for medical and industrial use. 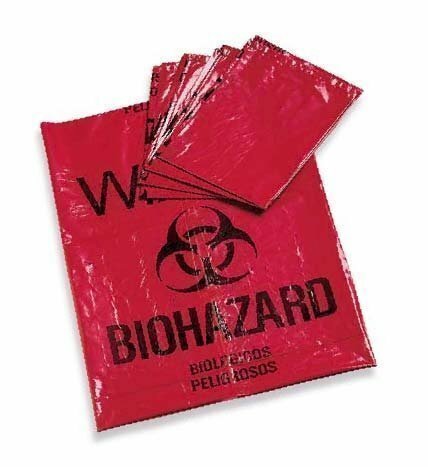 These large red biohazard waste disposal bags come in bulk and boast clear, easy-to-view biohazard symbols to identify harmful contents. OSHA compliant. 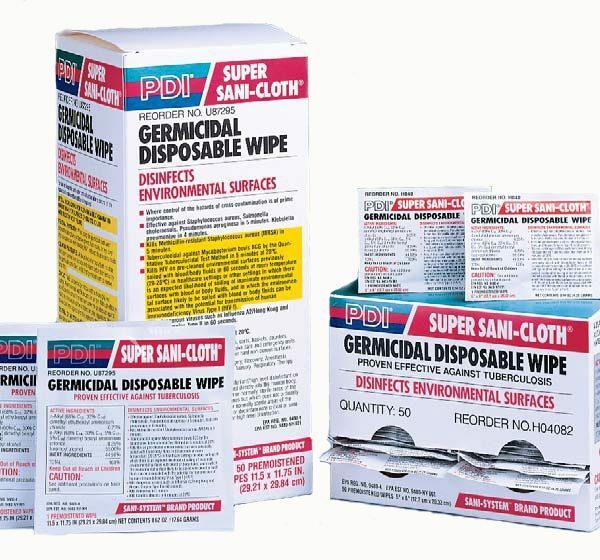 Super Sani-Cloth disinfectant disposable wipes kill TB, HIV & more on all hard surfaces. Ideal for home or industry. 50 wipes per box.